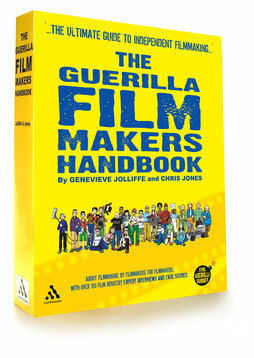 The Guerilla Film Makers Handbook US Edition has become THE DEFINITIVE handbook used and referred to by both emerging filmmakers and experienced filmmakers in America. It’s format is simple Q and A - the authors ask an expert in every field of film making process, from conception through to completion (and beyond), the ten questions any bright new film maker would ask if they had half an hour to chat over a coffee. And as the authors are three times feature filmmakers and veterans of the business, their questions are incisive, illuminating and to the point. There’s no film historian or lecture style discussion that could be irrelevant or distracting, just what a new filmmaker needs to know, how to do it, how long it will take, how much it will cost, the variables, and what pitfalls they should avoid. The book contains over 150 expert interviews with, runs for 720 pages and is near a million words of vital information. It’s lavishly illustrated from start to end, with diagrams, flow charts and photos. Industry expert interviews are contrasted by The Guerilla Film Makers Box Out Hot Tips, where the authors distil what it all means to the new film maker, and add their own money and time saving techniques. And of course HD and digital film making is now covered. The authors also tell their story of how they made three low-budget feature films, worked with Oscar-nominated actors and Harrison Ford’s brother, received a royal audience at the Palace, became a target for Turkish terrorists and ended up in a police cell - yet lived to tell the tale! The Guerilla Film Makers Handbook pulls no punches and is THE definitive guide - buy it and save yourself thousands of pounds. Chris Jones and Genevieve Jolliffe have written, produced and distributed award-winning low-budget feature films in the UK for the last fifteen years and their experience in this field is unparalleled. So do you want to read some of the book for free? Click on the Downloads to the right here and print it out.